Origin Native to Northern temperate zones of Asia, Europe and North America. 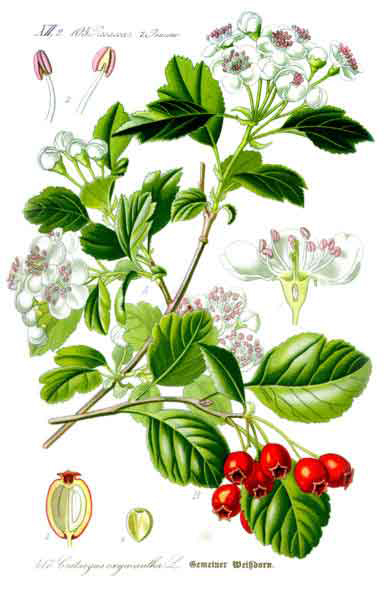 Crataegus monogyna is a hawthorn species being native to Northwest Africa, Europe and Western Asia. It is considered as an invasive weed in various parts of world. 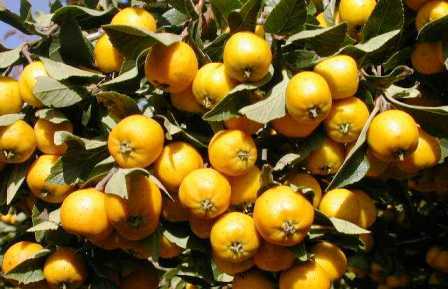 It is a small tree or shrub which is 5 to 14 m height with dull brown barks and vertical orange cracks. Stems Hawthorn belonging to the rose family is a common thorny shrub which grows up to the height of 5 feet in sunny wooded areas. 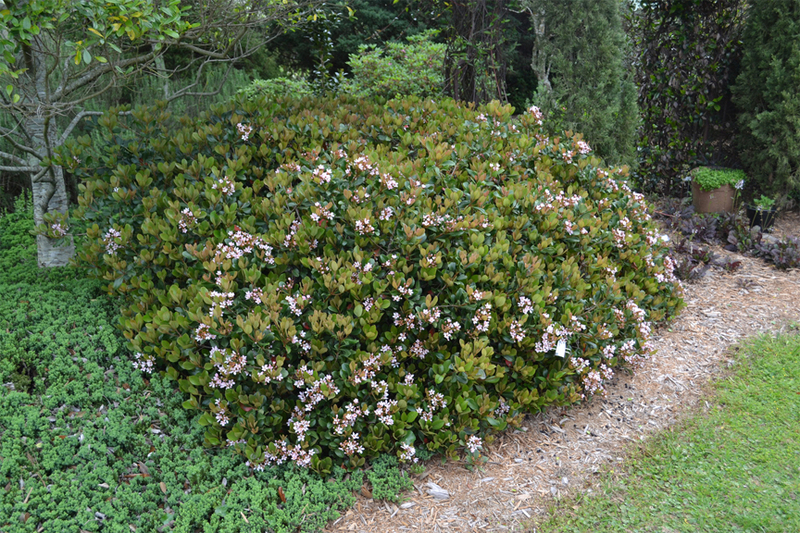 The plant blooms in May which grows in small white, pink or red clusters. Flowers give way to small berries called haws which becomes red when ripe. It has shiny leaves which grow in different shapes and sizes. Common names of Hawthorn are: Haw, Whitethorn, May, Hawthorn, Single-seeded hawthorn, Common hawthorn, Mayblossom, Quickthorn, Maythorn, Motherdie, One-seeded hawthorn, Red hawthorn, Singleseed hawthorn, Quick-set Hawthorn, Midland Hawthorn, Smooth hawthorn, Woodland hawthorn, Oneseed Hawthorn, May flower and Whitehorn. Since 1st century, hawthorn is used for treating heart problems, respiratory illnesses and circulatory disorders. 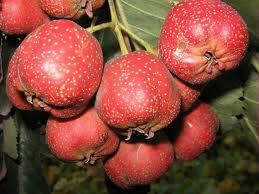 The fruits are used to cure high blood pressure, heartbeat, and hardening of arteries, chest pain and heart failure. Flowers and leaves are also used for medicinal purposes. The laboratory studies have shown that Hawthorn has antioxidants such as quercetin and oligomeric procyandins that helps to eliminate free radicals which damages cell membranes and also cause cell death. Flavonoids help to promote blood flow, assist in dilation of blood vessels and prevent damage of blood vessels. The flowers and leaves contain more flavonoids in comparison to berries. Hawthorn has been used for therapeutic and decorative purposes which dates back to 2,000 years. An ancient Greeks and Romans used it for corsages and wedding bouquets for marriage ceremonies. Romans regarded the leaves having ability to counteract evil spirits. The Greek medical doctor Discords used for therapeutic purposes in the 1st first century A.D. Hawthorn is grown like a hedge plant in England and Continental Europe. In folk medicine, leaves and flowers are used as a tonic for heart. Hawthorne was used in past as a diuretic to treat kidney stones. Later in 1800’s, doctors found some benefits of Hawthorn for heart. The extract made with the utilization of leaves and flowers was effective in cardiac health and contractility of heart muscles. Hawthorn has flavonoids that is able to promote blood circulation in the heart with the dilation of blood vessels in coronary arteries. 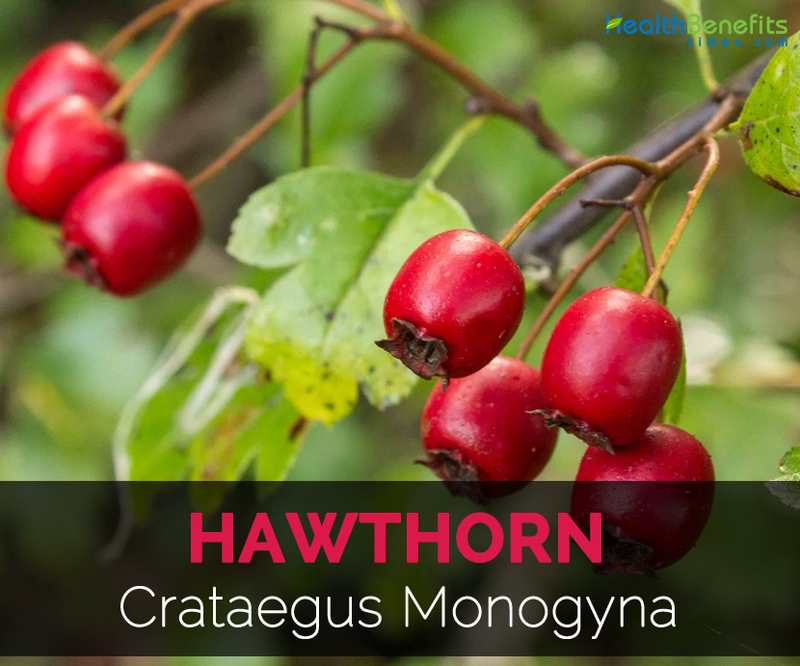 Native Americans used Hawthorne as a treatment for rheumatism and heart disease. Hawthorn bear sharp thorns of 1-1.5 m long. Leaves are deeply lobed, obovate measures 2 to 4 cm long. The underneath of leaves are paler and upper surface is dark green. The hermaphrodite flowers have five white petals, single style, numerous red stamens and measures 1 cm in diameter. The pollination occurs due to bees, midges and other insects. Flowers turn into numerous haws which are a small and oval fruit usually dark red in color. Fruit are like berries measuring 1 cm long with single seed inside. Haws are formed from May to September. usually dark red in color. Fruit are like berries measuring 1 cm long with single seed inside. Haws are formed from May to September. 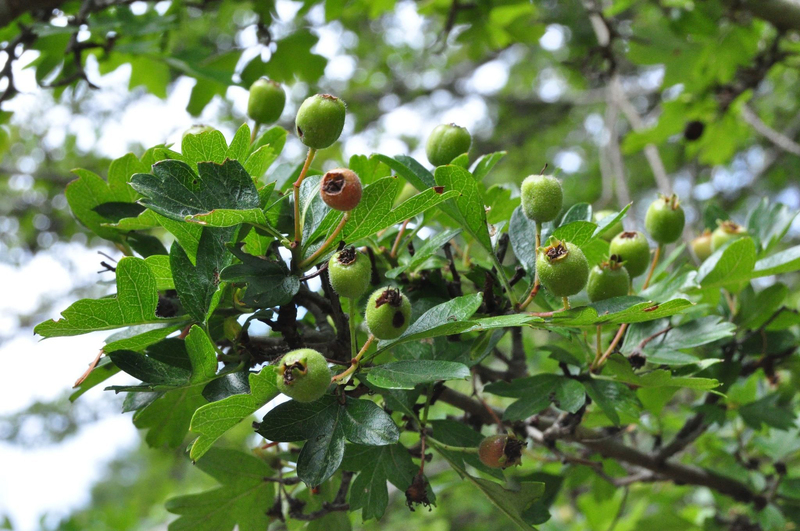 Hawthorn is used in candies and beverages due to its sweet and tart flavor. Besides its culinary uses, it is used in China and India for medicinal uses as a digestive aid and boost cardiovascular health. 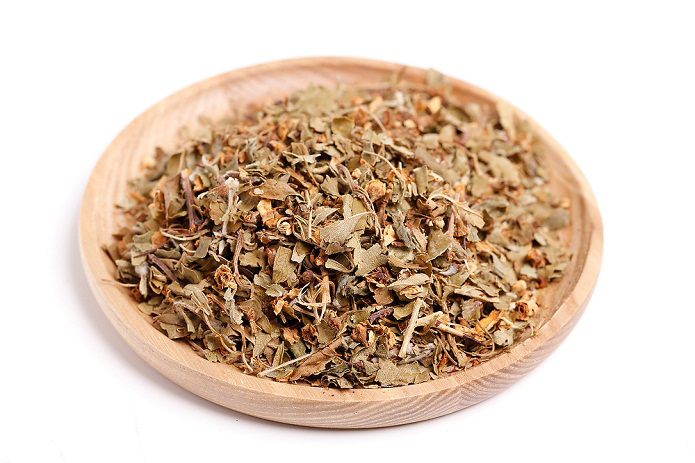 Hawthorn possess numerous health benefits including lower anxiety, regulation of blood pressure, promote digestion, prevent heart, lower chest pains, promote respiratory health, promote digestion, treatment for intestinal infections, enhance mood and skin health as well as its appearance. Chest pain is also known as angina that is very painful but not always indicate heart attack. But it is better to consult the doctor because it might be a signal for cardiovascular problems. 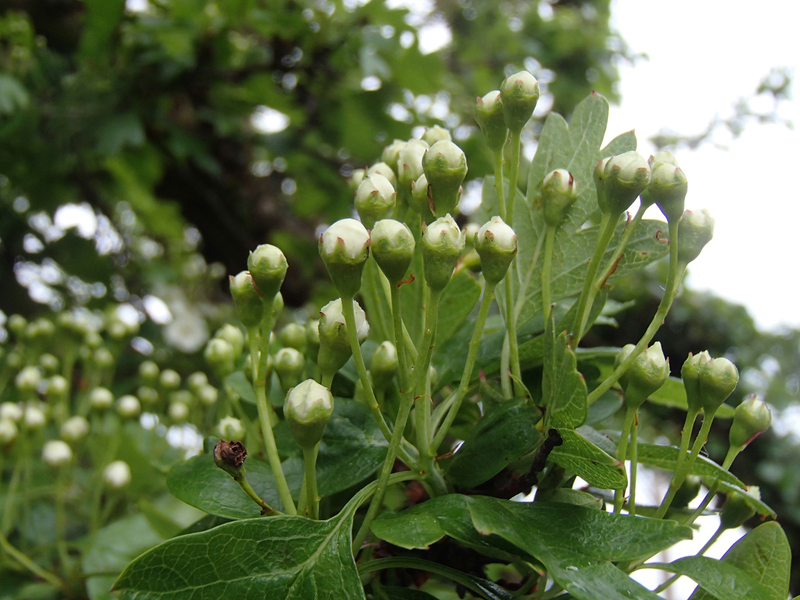 Hawthorn could lower the chest pain and has been used in traditional medicine for thousands of years. Hawthorn has positive impact on heart health. It has the ability to lower the chances of cardiovascular problems with an increase in stamina, boosting energy, lower shortness of breath and also eliminates fatigue. These small fruits contain catechins, saponins, organic compounds and other antioxidants that counteract free radicals that affect heart health. Hawthorn helps to normalize the level of blood pressure. The compound mixture found in Hawthorn establishes healthy blood pressure in the system and is useful for hypertension and hypotension patients. Antioxidants assist in the elimination of harmful toxins in the body. 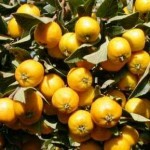 Vitamin C helps to promote the activity of white blood cells to promote overall health. 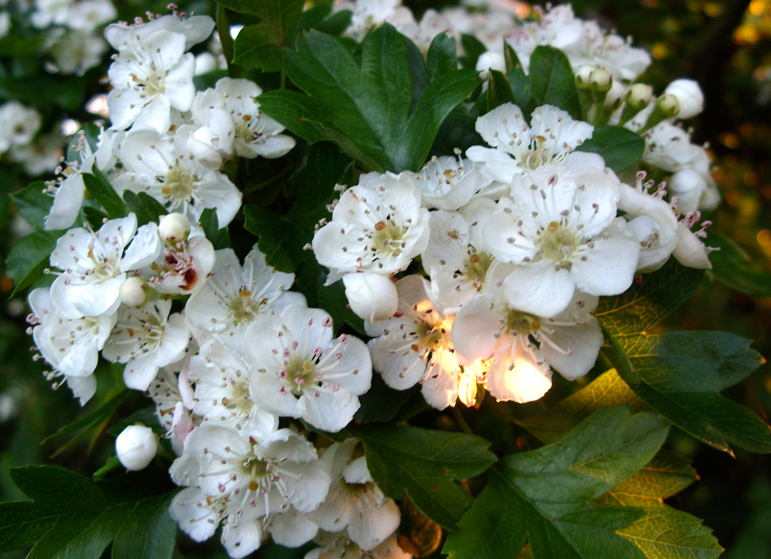 Hawthorn is useful for psychological conditions such as anxiety, stress and depression. It is effective to improve mood. It has a vital impact on hormonal levels. 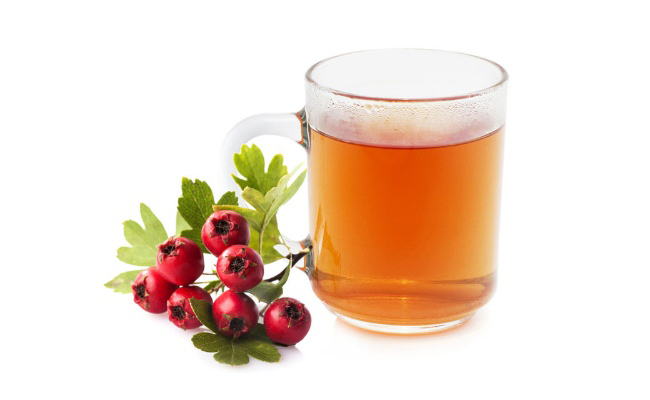 Hawthorn assists in the circulation of blood throughout the body that leads to high level of alertness and energy. The proper oxygenation of all body parts improves cognitive skills, rise energy levels as well as metabolism. 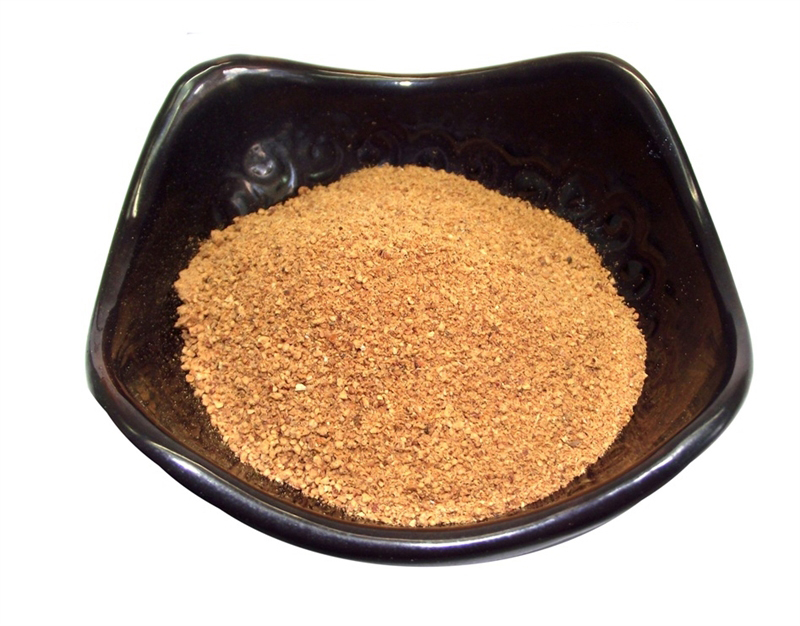 Hawthorn has organic compounds that improve nutrient digestion. It improves digestive process and eliminates the problems such as constipation, cramping, bloating and other serious conditions such as ulcers and colon cancer. 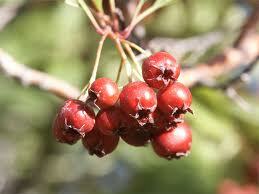 Antioxidants found in Hawthorn are useful in treating sores, burns and acne if applied topically to the skin. It has anti-inflammatory compounds that lower itching on healing wounds and skin conditions such as psoriasis and eczema. Along with the enhancement of digestive health, it promotes the uptake of nutrients and also eliminates constipation. It eliminates intestinal infections such as tapeworms from the body. 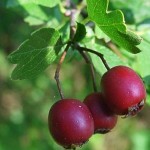 Various types of Hawthorn yield delicious red berries as well as leaves. The berries are cream-colored with a huge stone in the center. It has sweet flavor with unpalatable after taste. Hawthorn berries are used for making jams, jellies and preserves. 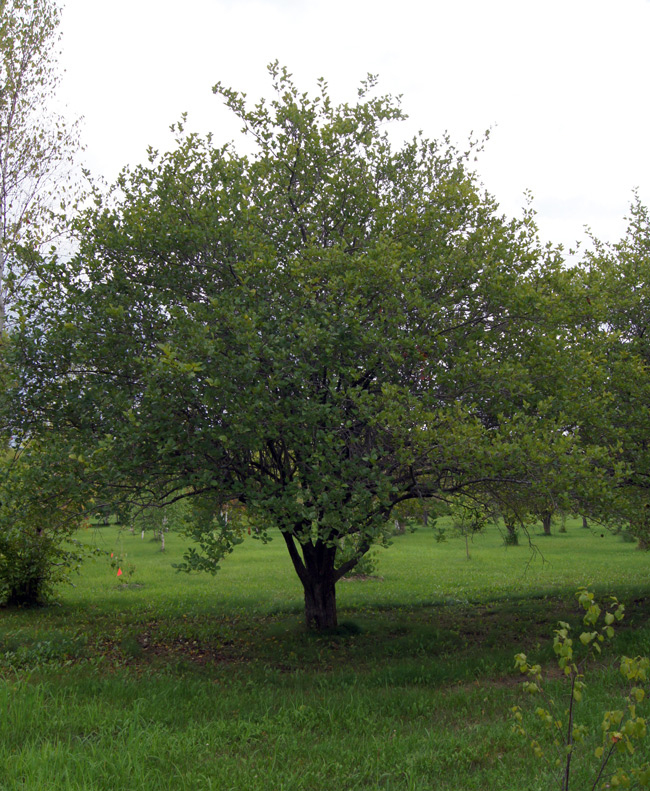 The Douglas Hawthorn is a hawthorn which reaches to a height of 30 feet. Similar to other hawthorns, the berries are used as a heart tonic. The berries are picked off from the tree and consumed raw or boiled and also used to make jam or dessert. The tree bear fruits in five to nine years. The fruits looks like a crab apple. The berries are used to make snacks and Haw flakes which is a dark pink candy. The berries are used to form jams, jellies and preserves. It is also used to make an alcoholic drink. One-Seed Hawthorn is a wild hawthorn that produces white blooms and red berries. It is a source of food for birds. The berries are dried and ground and used as a substitute for coffee. It is used for baking and also ingested in the form of jams, jellies and preserves. 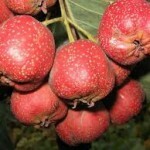 The leaves and berries are used as a treatment for heart disease, promote memory and also treats malaria. 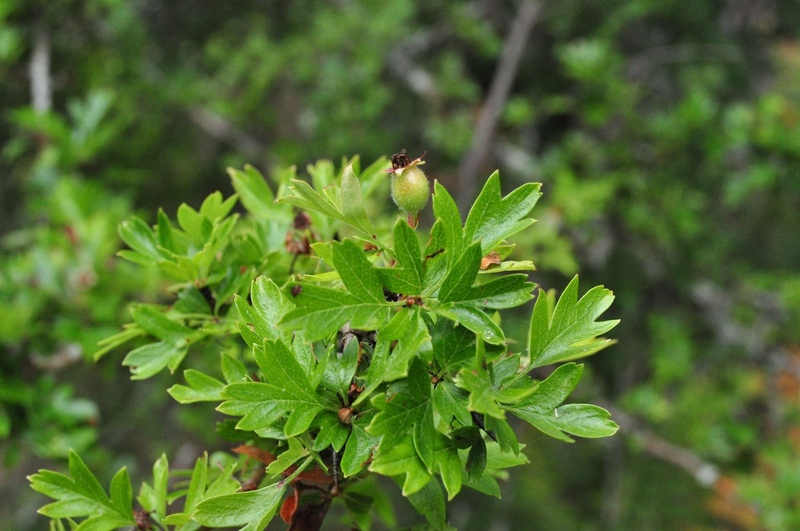 Mexican hawthorn is native to the mountainous regions of Mexico. The fruits are consumed raw or cooked as jam. The berries are also used to make candy. 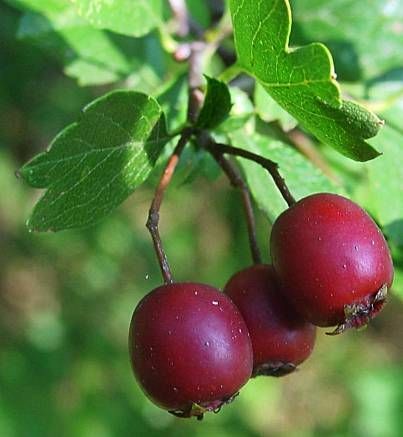 Hawthorn is used to treat chronic heart failure, chronic cor pulmonale, arrhythmias and senile heart . 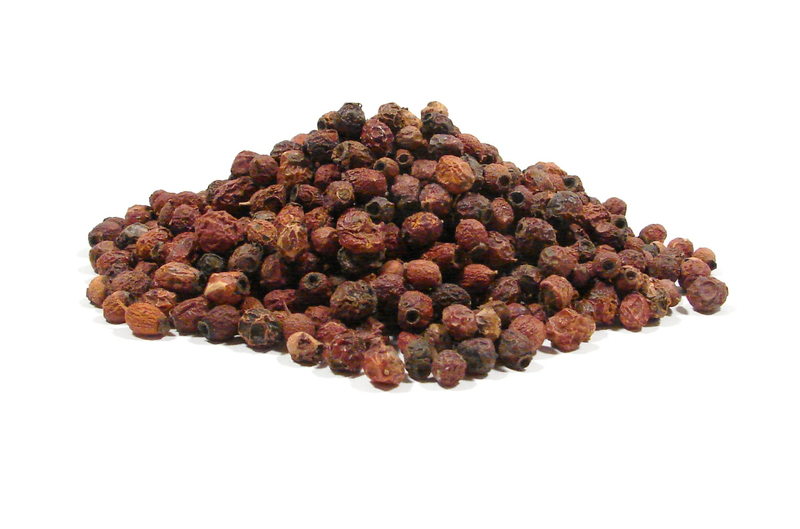 It is used for myocardial weakness, cardiac failure, hypertension, paroxysmal tachycardia, Buerger’s disease and arteriosclerosis. 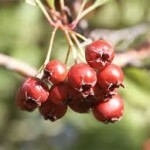 Use the leaf and flower of Hawthorn to lower cardiac performance. Hawthorn is used in folk medicine as a treatment for hypertension, cardiotonic, arrhythmia and ischemia of heart. 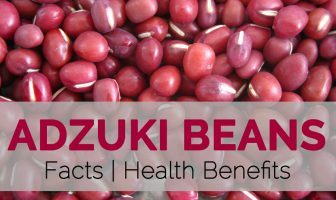 Rich in flavonoids, it prevents destruction of collagen in joins, decrease fragility of capillaries and lowers inflammation. It effectively lowers the level of cholesterol. In China, it is used for lowering blood stasis and food stagnancy. The therapeutic dilutions are effective for senile cardiac insufficiency, cardiac insufficiency, angina pectoris and dysrhythmia. 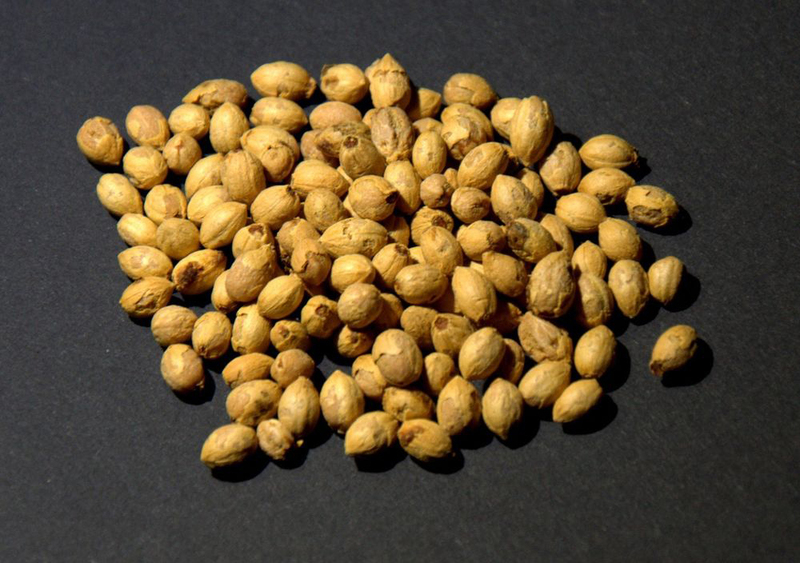 It is used for treating weak heart muscles, inflammation and nervous heart problems. 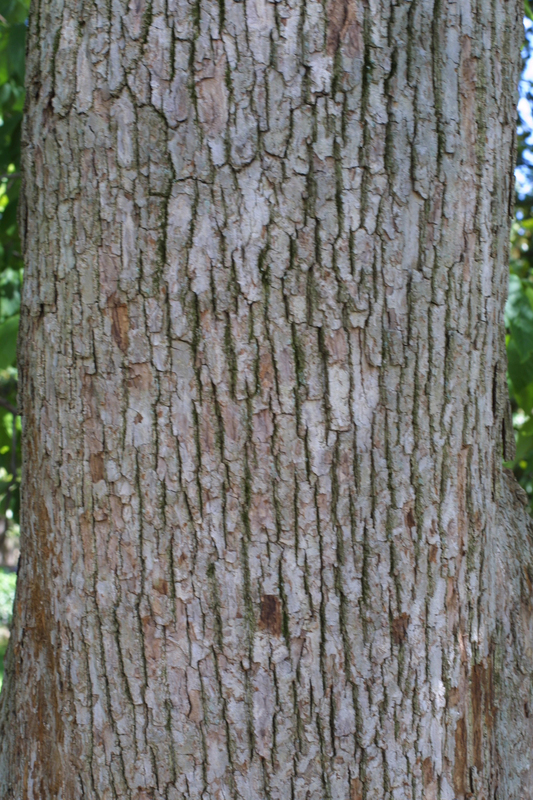 The bark is used as a cure for fevers and malaria. Roots are used to vitalize heart arteries. It promotes heart health, palpitations, shortness of breath and exercise tolerance. 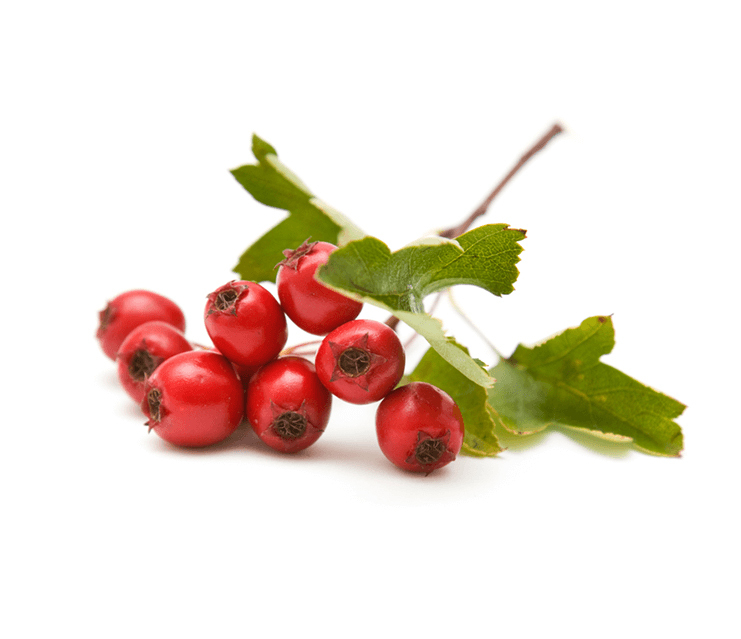 The leaf, fruit and flower of Hawthorn are contraindicated for breastfeeding and pregnant women. High dose of Hawthorn results in cardiac arrhythmia, hypotension, low blood pressure and sedation. It might cause adverse effects such as tremor and dizziness. When used with beta blockers, it causes a hypertensive effect. Not recommended to use for the children below 12 years of age. Its side effects are fatigue, nausea, sweating and sedation. 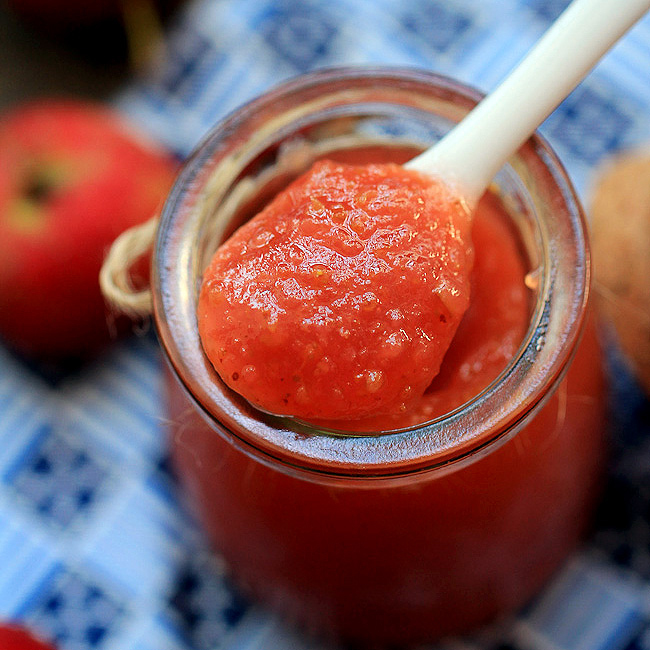 Fruits are used in making jams, jellies and syrups. The fruits are also used in making wine or add flavor to brandy. The edible petals and leaves are added to salads. Fruits are consumed raw or cooked. The grounded fruit are mixed with flour and used to make bread. In China, dried leaves are used as a substitute for tea. Roasted seeds are used as a substitute for coffee. It is used in candies and beverages. Native Native to Northern temperate zones of Asia, Europe and North America. Calories 139 K cal. Calories from Fat 5.67 K cal.